Pet Dogs are welcome here!!! Treetops has spectacular views of the Waitangi river from it's large wrap around deck. It is surrounded by native bush and birds Only five minutes to beach and cafes, restaurants and supermarket. Waitangi Golf Course is virtually on your doorstep.. 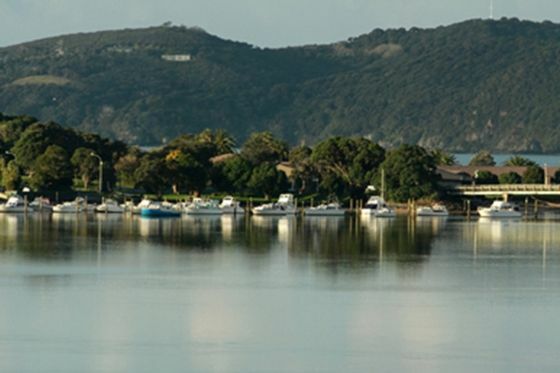 The Bay of Islands is well known for great Sailing , swimming, Fishing and Parasailing and lots more...there are plenty of choices for your morning Flat White, or a late afternoon Alfresco Wine with the most beautiful outlook over the Bay. smoking outside only, with consideration, to fire risk. You break it , you pay for it. if cleaning is required fee will be deducted from the bond. A lovely house with a view. A lovely house with a view. Well appointed and a quiet location. Beds are made up the European way...all bedding is washed after each departure. most NZ houses have no fly screens... and the house is the way it is there are plenty of powerpoints...you seem to be the first one who cant find them.. Seeing you are a new member hopefully you get used to it. An easy drive from Paihia (or an easy paddle board). An easy drive from Paihia (or an easy paddle board). A nice new and clean house with a private feel. Thanks very much would love to stay again. Private, serene, relaxing and peaceful. Private, serene, relaxing and peaceful. A lovely spot in the bush gives you an illusion of no neighbours plus a lovely view over to Waitangi. We and our 2 dogs had a fabulous 3 short night stay. Lots of rules and I agree about leaving shoes outside. Being made to feel a little more welcome and less like we have walked into your home where we can't touch a thing would be nice. The new microwave will be handy and a bbq too would be great so you can cook al freso while enjoying the lovely view.